Transparent film dressings are thin sheets of transparent polyurethane (polymer) coated with an adhesive. These dressings are available in a variety of sizes and shapes. Transparent film dressings provide a moist, healing environment; promote autolytic debridement; protect the wound from mechanical trauma and bacterial invasion; and act as a blister roof or “second skin.” Because they’re flexible, these dressings can conform to wounds located in awkward locations such as the elbow. The transparency makes it easy to visualize the wound bed. Transparent film dressings are waterproof and impermeable to bacteria and contaminants. Although these dressings can’t absorb fluid, they’re permeable to moisture—allowing one-way passage of carbon dioxide and excess moisture vapor away from the wound. A transparent film dressing won’t adhere to a moist surface because its adhesive properties are deactivated by moisture. 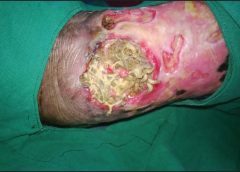 degree burns, suspected or active infection, fungal infection, or active herpetic lesions. These dressings can cause periwound maceration. 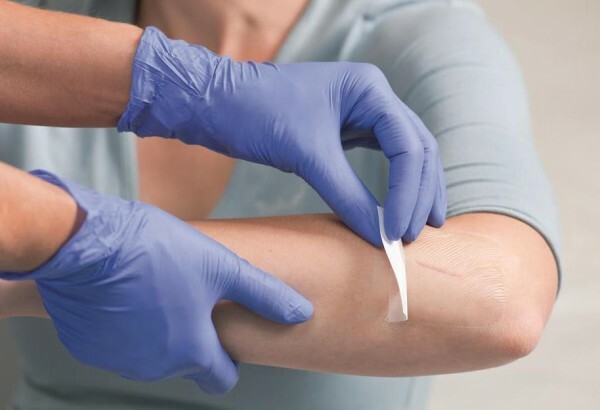 Transparent film dressings aren’t recommended for patients with fragile or thin skin, especially elderly patients, or in patients receiving steroids because removal may cause epidermal stripping or skin tears. Follow these steps to apply a transparent film dressing. 1 Wash your hands and put on gloves. 3 Remove your gloves, wash your hands, and put on new gloves. 4 Clean the wound with normal saline solution or prescribed cleanser. 5 Dry the tissue surrounding the wound by patting it with a 4″ × 4″ gauze pad. 6 Remove your gloves, wash your hands, and put on new gloves. 7 Make sure the skin is clean and dry. Some manufacturers recommend defatting the skin with alcohol to increased dressing adhesion. Apply a liquid barrier film or moisture barrier to the periwound area to protect the skin from wound exudate. 8 For deep wounds, apply wound filler or packing material as indicated. 9 Peel the liner from the dressing to expose the adhesive surface. 10 View the wound or site through the film and center the dressing over it. Don’t stretch the dressing during application. 11 Smooth the dressing in place from the center outward. 12 Remember that the dressing should be at least 1″ larger than the wound. 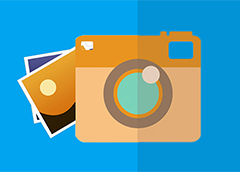 Check individual manufacturer recommendations because some dressings require a 2″ border. 13 Dispose of the waste; then remove your gloves and discard them. Follow these steps to remove a transparent film dressing. 1 Lift a corner of the dressing and stretch it horizontally along the skin surface to break the adhesive bond. 2 Continue stretching from the edge of the dressing toward the center. 3 When two sides of the dressing are partially removed, grasp both sides and stretch them horizontally and parallel to the skin until the entire dressing lifts. The average time between transparent film dressings is 3 to 5 days, although the dressing may be left in place up to 7 days. The frequency of change can vary based upon manufacturer recommendations. If the transparent dressing becomes loose, if leakage is present, or new skin irritation or redness is noted, change the dressing and reassess whether continued use is appropriate. Nancy Morgan, cofounder of the Wound Care Education Institute, combines her expertise as a Certified Wound Care Nurse with an extensive background in wound care education and program development as a nurse entrepreneur. Information in Apple Bites is courtesy of the Wound Care Education Institute (WCEI), copyright 2014. How do we have bath with this dressing on? Or if required, can I sponge or speak with nursing alcohol to keep rest of body clean. I have an entire arm I arm shoulder n face in dressing. My husband has a open wound near his tail bone but can’t the transparent dressing to stay on what can I do?